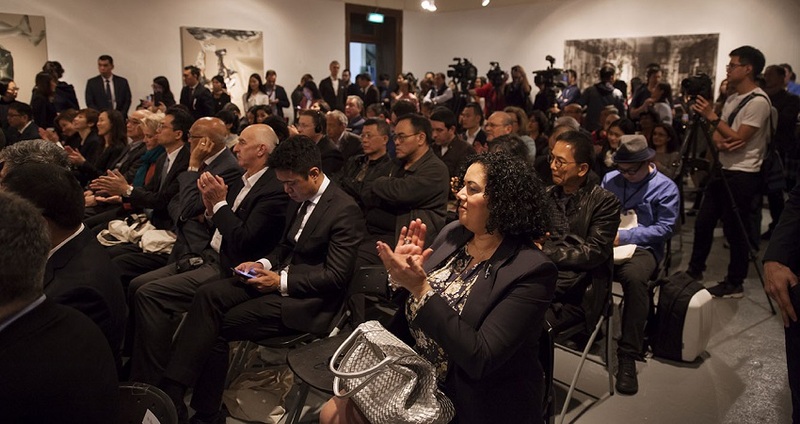 The Script Road – Macau Literary Festival had its official opening on Saturday, 4 March, at the Old Court Building. Macau SAR Government Secretary for Social Affairs and Culture Dr Alexis Tam Chon Veng was in attendance at the Official Opening Ceremony and Inauguration of the Script Road Exhibitions, on Saturday, March 4, at the Old Court Building. President of the Macau Foundation Administrative Council, Mr Wu Zhiliang; President of the Cultural Affairs Bureau, Mr Leung Hio Ming; Director of the Macau Government Tourism Office, Ms Maria Helena de Senna Fernandes; and President of the Macau Pen Club, Mr Li Guangding, were also among the high-profile figures attending this year’s inaugural festivities. The Script Road was honoured to have among its official guests the Deputy Director-General of the Department of Culture and Education of the Liaison Office of the Central People’s Government in the MSAR, Mr Zhao Chuan Dong; the Consul-General of Portugal in Macau and Hong Kong, Mr Vítor Sereno; the Consul for Culture and Public Relations of the Republic of Korea in Hong Kong, Mr Yu Byung-chae; the Consul-General of the United States of America in Hong Kong and Macau, Mr Kurt W. Tong; the Consul of Australia to Hong Kong and Macau, Mr Damien Dunn; and the Education Attaché of the Consulate-General of France in Hong Kong and Macau, Ms Servane Gandais.